Wednesday, the 26th of November, 1651. RESOLVED, That the additional Bill for Sale of the Estates of Delinquents be brought in on Tuesday next. Sir Henry Vane reports, from the Council of State, an Instruction, in Pursuance of the Order of Parliament referring it to them; viz. "You are to cause all Warrants whereby you charge the Treasury of this Commonwealth upon the respective Treasuries thereof, in Pursuance of the Instructions already given you, or to be given you, by Parliament, to be fairly ingrossed in a Book: Which Book, together with an Abstract of the Heads of the Disbursements made by virtue of such Warrants, you are to deliver into the Parliament, upon the First of December 1652. And as to that Head of Disbursements which concerns Incidents for the managing of Intelligence, you are to cause the same to be stated in the gross Sum, to be allowed by yourselves for the full Discharge thereof unto all Persons concerned in the issuing or receiving of the same." Resolved, That this Clause be added to this Instruction: viz. "And all Warrants, granted by you for the issuing of Monies, or Imprisonment of any Person, in Pursuance of your Instructions, shall be signed with the Hands of Five or more of you." Resolved, That this Instruction, so amended, shall be one of the Instructions for the Council of State for the Year ensuing. Resolved, That this shall be one Instruction for the Council of State for the Year ensuing; viz. "You have also Power, and are hereby authorized, to give all due Encouragement to the Exercise of the Fishing Trade, by the People of this Commonwealth, upon the Coasts of England, Scotland, and Ireland; and to promote the same to the best Advantage of this Commonwealth, by all such Ways and Means as you shall think fit." Sir Henry Mildmay, Tellers for the Yeas: 34. Mr. Strickland, Tellers for the Noes: 50. Sir Henry Mildmay, Tellers for the Noes: 42. Mr. Strickland, Tellers for the Yeas: 44. Sir Henry Mildmay, Tellers for the Noes, 42. Mr. Strickland, Tellers with the Yeas: 44. So it was Resolved, That no Person of any Committee of Parliament, or of the Council of State, shall be in the Chair of that Committee, or Council, for any longer Time, at once, than One Month. Resolved, That the Admiralty be placed in the Council of State for the Year ensuing, as it was formerly settled: And that an Act be brought in for that Purpose. 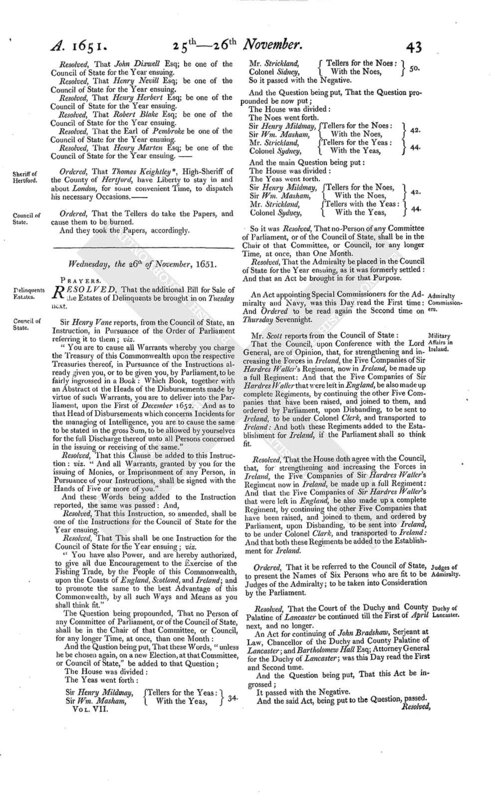 An Act appointing Special Commissioners for the Admiralty and Navy, was this Day read the First time: And Ordered to be read again the Second time on Thursday Sevennight. That the Council, upon Conference with the Lord General, are of Opinion, that, for strengthening and increasing the Forces in Ireland, the Five Companies of Sir Hardres Waller's Regiment, now in Ireland, be made up a full Regiment: And that the Five Companies of Sir Hardres Waller that were left in England, be also made up complete Regiments, by continuing the other Five Companies that have been raised, and joined to them, and ordered by Parliament, upon Disbanding, to be sent to Ireland, to be under Colonel Clerk, and transported to Ireland: And both these Regiments added to the Establishment for Ireland, if the Parliament shall so think fit. Resolved, That the House doth agree with the Council, that, for strengthening and increasing the Forces in Ireland, the Five Companies of Sir Hardres Waller's Regiment now in Ireland, be made up a full Regiment: And that the Five Companies of Sir Hardres Waller's that were left in England, be also made up a complete Regiment, by continuing the other Five Companies that have been raised, and joined to them, and ordered by Parliament, upon Disbanding, to be sent into Ireland, to be under Colonel Clark, and transported to Ireland: And that both these Regiments be added to the Establishment for Ireland. 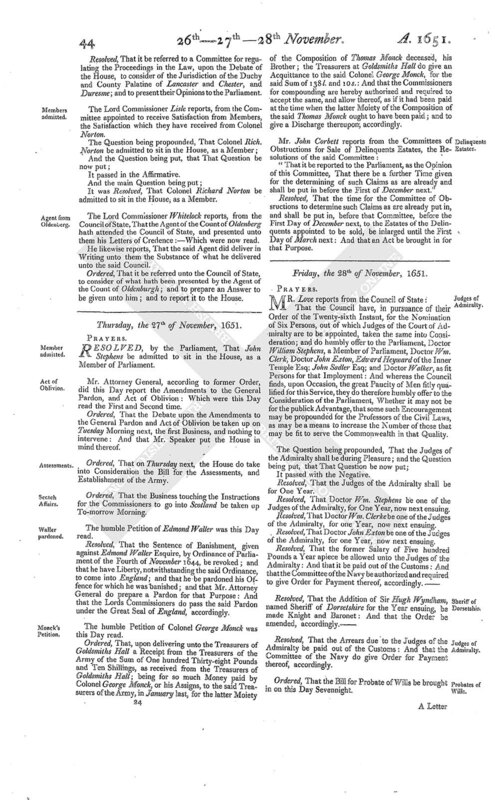 Ordered, That it be referred to the Council of State, to present the Names of Six Persons who are fit to be Judges of the Admiralty; to be taken into Consideration by the Parliament. Resolved, That the Court of the Duchy and County Palatine of Lancaster be continued till the First of April next, and no longer. An Act for continuing of John Bradshaw, Serjeant at Law, Chancellor of the Duchy and County Palatine of Lancaster; and Bartholomew Hall Esq; Attorney General for the Duchy of Lancaster; was this Day read the First and Second time. And the said Act, being put to the Question, passed. Resolved, That it be referred to a Committee for regulating the Proceedings in the Law, upon the Debate of the House, to consider of the Jurisdiction of the Duchy and County Palatine of Lancaster and Chester, and Duresme; and to present their Opinions to the Parliament. The Lord Commissioner Lisle reports, from the Committee appointed to receive Satisfaction from Members, the Satisfaction which they have received from Colonel Norton. It was Resolved, That Colonel Richard Norton be admitted to sit in the House, as a Member. The Lord Commissioner Whitelock reports, from the Council of State, That the Agent of the Count of Oldenberg hath attended the Council of State, and presented unto them his Letters of Credence :-Which were now read. He likewise reports, That the said Agent did deliver in Writing unto them the Substance of what he delivered unto the said Council. Ordered, That it be referred unto the Council of State, to consider of what hath been presented by the Agent of the Count of Oldenburgh; and to prepare an Answer to be given unto him; and to report it to the House.